Members of the Armed Forces Honor Guard of Baldwin County follow traditional flag folding protocol. They follow a script, but they’re not actors. The men and women of the U.S. Armed Forces Honor Guard of Baldwin County don’t take center stage either. Their role is on the perimeter, standing guard and performing military honors at dozens of veterans’ funerals and other patriotic ceremonies every year. Veterans themselves, they often arrive an hour before the ceremony wearing white military shirts, summertime polyester pants, Air Force flight caps, ties and, at formal events, jackets. Their shirts are adorned with honor guard insignia and a selection of each veteran’s ribbons. After inspection, they align for the traditional 21-gun salute — sometimes three, sometimes five, sometimes seven riflemen — while they also perform taps and a flag folding ceremony with a presentation to the next of kin. 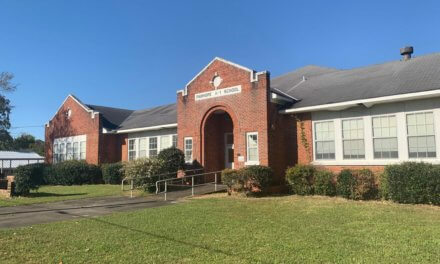 “We are one woman and 15 guys and we’ll go to any cemetery in the county for any veteran’s funeral,” Tipp said, noting he personally performed 51 ceremonies at the Alabama State Veterans Cemetery in Spanish Fort last year, along with 19 at other cemeteries and several flag folding ceremonies at area schools. Tipp himself spent six years in the Navy, including a tour as a swift boat gunner in Vietnam. He later enlisted in the Army where he had a 24-year career, retiring as a major general. He walks with a slight stoop, but when at attention he’s a straight as a flagpole. Honors Program,” Tipp said with more burials, the increasing age of volunteers and few recruits, it is becoming increasingly difficult to meet demand. When they can’t have seven riflemen, they try to assemble five. When that’s not possible, three is the minimum. Jim Dixon, a veteran of six years of service in the Army, is a younger volunteer. According to 2017 U.S. Census data, Baldwin County is home to nearly 19,000 veterans. The Department of Veterans Affairs estimates the country will lose the bulk of its remaining estimated 300,000 surviving World War II veterans by 2025, with an average of 362 dying every day. 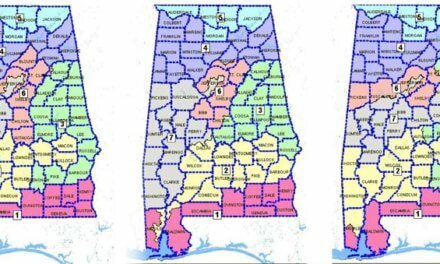 The Alabama State Veterans Memorial Cemetery, dedicated in 2012 and open in 2013, reported 1,840 internments through March 30, 1,537 of which were veterans. Two weeks ago, the guard found itself at the Grand Hotel, honoring the service of William Edmund Butterworth III, better known by his pen name W.E.B. Griffin. Also a veteran of WWII and the Korean War, Griffin went on to write more than 30 novels before his death in February. 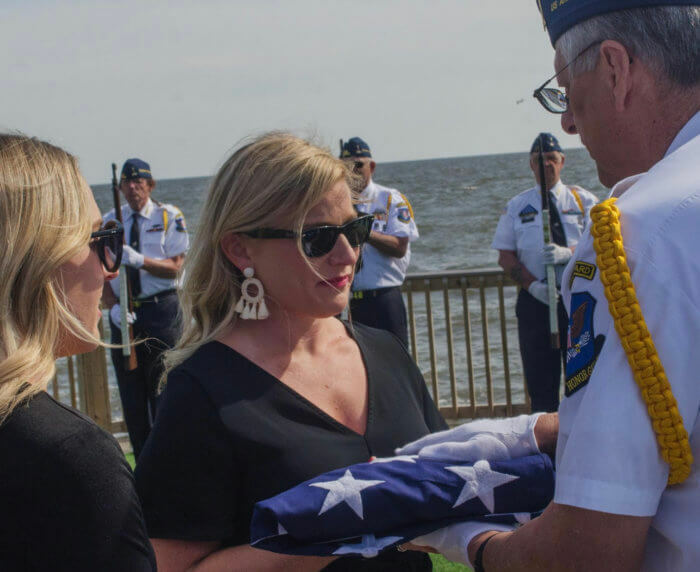 On March 23, his friends and family gathered on the shores of Mobile Bay to remember his life and body of work while smoking cigars and drinking cocktails. Before they presented Griffin’s granddaughter Catherine Butterworth with the American flag, the Armed Forces Honor Guard performed the traditional 13-step flag folding ceremony and a 21-gun salute. They use WWII-era rifles chambered with 30.06 blank ammunition. The volley of fire cut through an otherwise quiet waterfront scene. 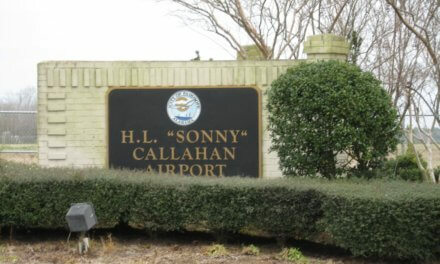 Tommy Langham spent eight years in the Navy before he reenlisted in the Air Force in the late 1950s. He was a crew chief on a B47 bomber, and his commander was Paul Tibbets, the pilot of the Enola Gay the day it dropped an atomic bomb on Hiroshima. In the Honor Guard, he serves as bugler. He had previous experience playing “Taps” on a harmonica. “I became a member of the VFW Honor Guard in the ‘70s, when there were a lot of casualties coming back from Vietnam. 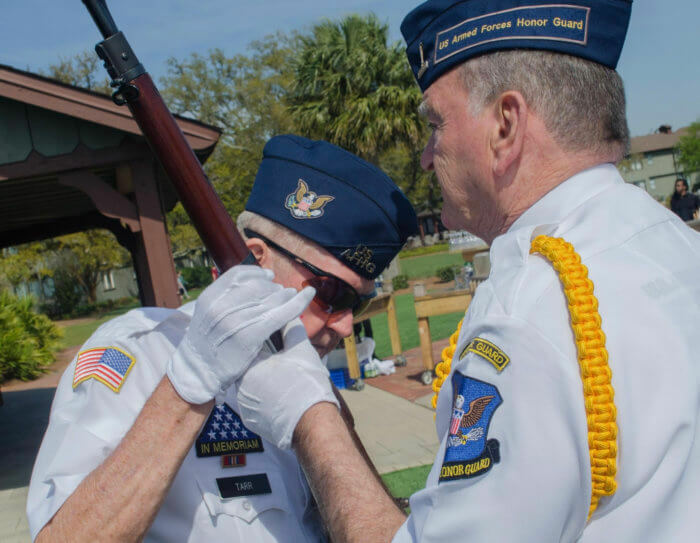 When I moved back to Fairhope, they didn’t have an honor guard at the time so we started this one in 1998 and have been doing it ever since,” Langham, 83, said. 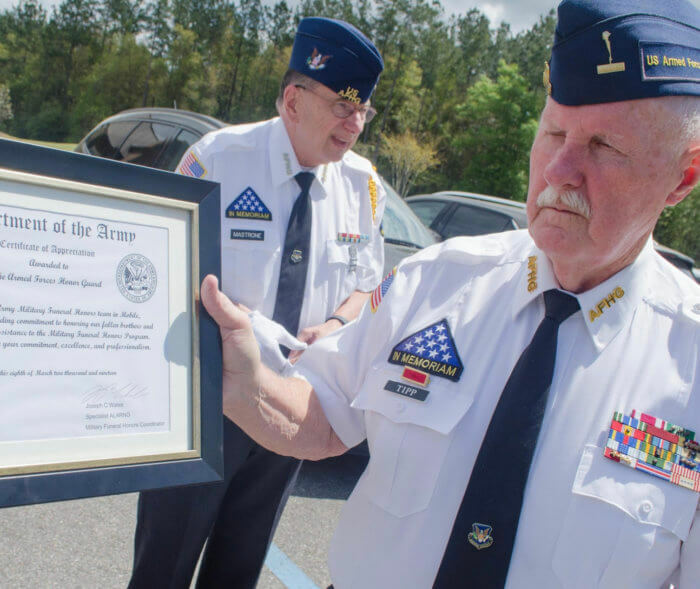 Any veteran honorably discharged with time on their hands and a duty to serve is welcome to join the U.S. Armed Forces Honor Guard of Baldwin County. It is a strictly volunteer position. For more information email usafhgbaldwincountyal@gmail.com or call 251-545-6578. Separately, the Alabama State Veterans Memorial Cemetery will host a Memorial Day celebration Monday, May 27. There will be a program followed by the placement of a flag at every gravesite by local volunteers, scouts and surviving relatives.